Many of you know that we're a little touchy about boating accidents in our family. My dad's father died in a squall in the mid-1990s and my dad's small sailing skiff was literally run over by a fishing boat while out enjoying a Saturday sail a few summers ago. 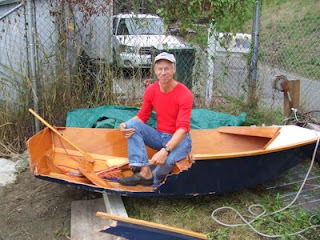 While in college, a boater ran over one of our crew shells, resulting in minor injuries and broken equipment. Chris and a few other rowers detained the guys (belligerent and drunk) until the police showed up. It was not a fun day. Sadly, there are many, many more examples. Like the jet skier who tried to jump over a Lakeside crew shell. It did not end well. The search resumed this morning for a rower missing after an accident Thursday on Lake Stevens. The man was tossed from his crew rowing shell after it collided with a ski boat. Two people in the shell were tossed into the water. A woman was pulled out and was uninjured, but a 41-year-old man is missing. Lake Stevens Police Chief Randy Celori says boats and dive teams searched the lake Thursday and the search resumed Friday morning. The man was last seen in the water about 7:45 p.m. Thursday. Celori says the ski boat appears to have struck the row boat near the boat launch on the east side of the lake. "The whole rowing community is devastated by shock. They're part of a family of rowers," said Tony Scoringe, with the Lake Stevens Rowing Club, where the two rowers were members. "Rowing as a sport continues to be a wonderful experience." He said the pair were part of a masters rowing program that trained Tuesdays, Thursdays and weekends. "We're hoping the recovery effort is successful as soon as possible," Scoringe said, adding that the shell was severely damaged in the crash. Update: The man's body has been recovered. He was a 42 year old father of four and longtime rower. The driver of the boat was a 17 year old kid who was getting ready to pull a water skier.